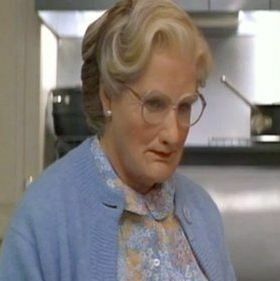 In news that has hit us with the force of a run-by fruiting, The Hollywood Reporter announced this evening that a Mrs. Doubtfire sequel is finally in the offing. The reboot would see Robin Williams reuniting with director Chris Columbus, with Elf scribe David Berenbaum attached to write. A sequel has been in the works for years, but only became active again early this year with Berenbaum’s involvement. THR reports that “Williams and Columbus are attached and hopeful.” We’re hopeful too! Along with Dumb and Dumber To, this would mark the second beloved early-’90s comedy classic to get the long-awaited reboot treatment. We think we speak for everyone when we say: Don’t screw this up, poppets.